DevExpress MVVM Framework. Using DataAnnotation attributes and DevExpress Fluent API. Getting Started with DevExpress MVVM Framework. Commands and View Models. DevExpress MVVM Framework. Introduction to Services, DXMessageBoxService and DialogService. DevExpress MVVM Framework. Interaction of ViewModels. IDocumentManagerService. DevExpress MVVM Framework. Introduction to POCO ViewModels. DevExpress MVVM Framework. Interaction of ViewModels. Messenger. DevExpress MVVM Framework. Using Scaffolding Wizards for building Views. DevExpress MVVM Framework. Data validation. Implementing IDataErrorInfo. THIS POST: DevExpress MVVM Framework. Using DataAnnotation attributes and DevExpress Fluent API. DevExpress MVVM Framework. TaskbarButtonService, ApplicationJumpListService and NotificationService. DevExpress MVVM Framework. Asynchronous Commands. Imagine configuring editing and validation settings from one place – eliminating the need to separately configure each data view (XAML). DataAnnotation attributes allow you to do exactly that. Beginning with version 13.2, a consistent set of functionalities were implemented across all our controls. Originally, GridControl provided limited support for attributes and cell editors could not be configured by attributes specifying an editor data type. Bands could not be set at the data source level. Moreover, DataAnnotation attributes did not exist for PropertyGridControl. Now, PropertyGridControl, GridControl, and DataLayoutControl provide a similar functionality, and the Scaffolding Wizard also takes assigned attributes into account. We also introduced a flexible alternative in version 13.2 – the DevExpress Fluent API. DevExpress PropertyGridControl, GridControl, DataLayoutControl, and Scaffolding Wizards support nearly every standard attribute in the System.ComponentModel.DataAnnotations namespace. We also implemented a number of our own attributes for defining masks. These attributes are available from the DevExpress.Xpf.Mvvm.DataAnnotations namespace. To learn more about the available attributes, see the following help topic: Data Annotation Attributes. Although this approach is simple and descriptive, your code may become difficult to read when there are many properties. You may also find your model class does not allow attribute decorations. For example, a WCF Data Service or the Entity Framework Database First approach may automatically generate model classes. 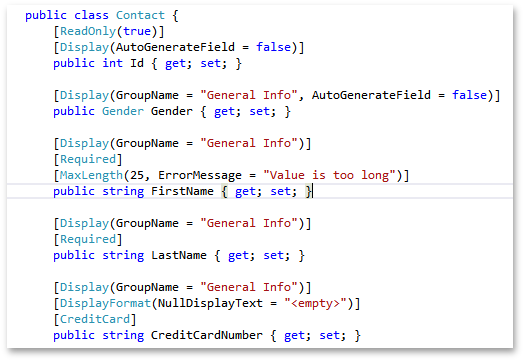 You can extend this approach to automatically generated classes using partial classes. The obvious disadvantage is the metadata class is both difficult to support and error prone. For instance, you will not receive an error at compile time if you rename a model property and forget to do the same for its metadata class. Since the DevExpress Fluent API does not allow setting attributes on non-existent properties, renaming properties becomes easy. While the Fluent API is valuable in complex scenarios, in simple cases it still makes sense to use one of the standard approaches. We have a few demos that clearly demonstrate how to use attributes with our controls: “Data Grid - Smart Columns Generation”, “Layout Manager - Data Layout Control”, “Property Grid - DataAnnotation Attributes”, “Property Grid - DataAnnotation Attributes (Fluent API)”. Please refer to them to see our controls in action. To configure the GridControl layout in for the underlying data types and attributes, set the GridControl.EnableSmartColumnsGeneration property to True. 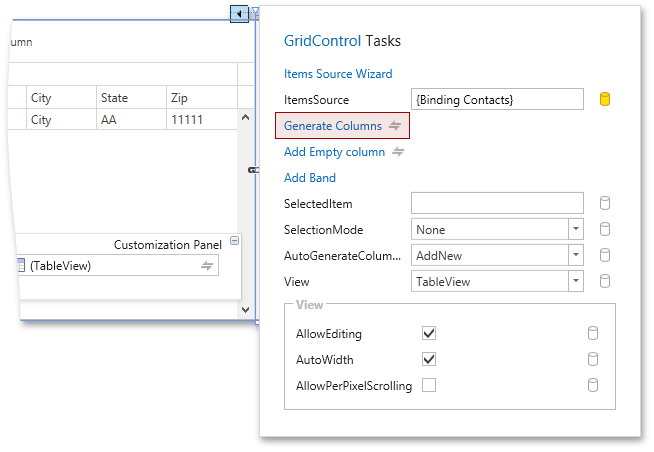 In this case, GridControl will automatically generates columns at runtime and customize them according to DataAnnotation and DevExpress Fluent API usage. Generated columns have their IsSmart property set to True. It means that these columns are configured automatically. In the meantime, you are free to set any property manually – your settings will override the automatic settings. The Scaffolding Wizard generates a simple LayoutControl with LayoutGroup and LayoutItem objects. You can customize them in the designer as you like. PropertyGridControl automatically generates rows for the defined attributes. PropertyGridControl provides the capability to initialize properties at runtime. In this scenario, you could opt for a custom item initializer. For this, assign the InstanceInitializer attribute to the required property. At runtime, a user will see an additional “Item1” button in the Property Menu. When s/he presses this button, the Item property will be set to a new Item1 class instance. I great topic in this series could be to give some guidance of how to do internationalization (translation) of the UI and what approach would be recommended (annotations or fluent api). Do you also have this MVVM library for Windows 8 XAML based apps (I don't have any experience with developing Win8 apps yet, just curious) ? At the moment, we don't have such a library for Windows 8 XAML. We will consider creating one in future releases. Anyway, there are some useful classes in DevExpress.Core (for example, DelegateCommand and BindableBase). You can use them in your application. If such Fluent API can be used with Domain Components will it be a such great advance. Can we ask for such thing Fluent API with XPO and DC? Very nice but how to set AutgenerateField using Fluent API? Is it possible in code to get a list of all the attributes that are 'broken'. So I could set a property on the class as IsSaveable, which is set to true when all the attributes are valid? We apologize for the delayed response. Currently, comments to blogs don't provide opportunities to give a detailed answer with corresponding code or/and sample project. Thus I kindly ask you to contact our support team by submitting a ticket to our SC (you can do this here: www.devexpress.com/.../Create). We will be happy to assist you. Almost 5 years old this information, do you have more updated information regarding these articles? Information in this blog post is still up-to-date, but we haven't yet moved it to our documentation. I've just replied in your ticket where you sent your current implementation. Let's continue our discussion there.